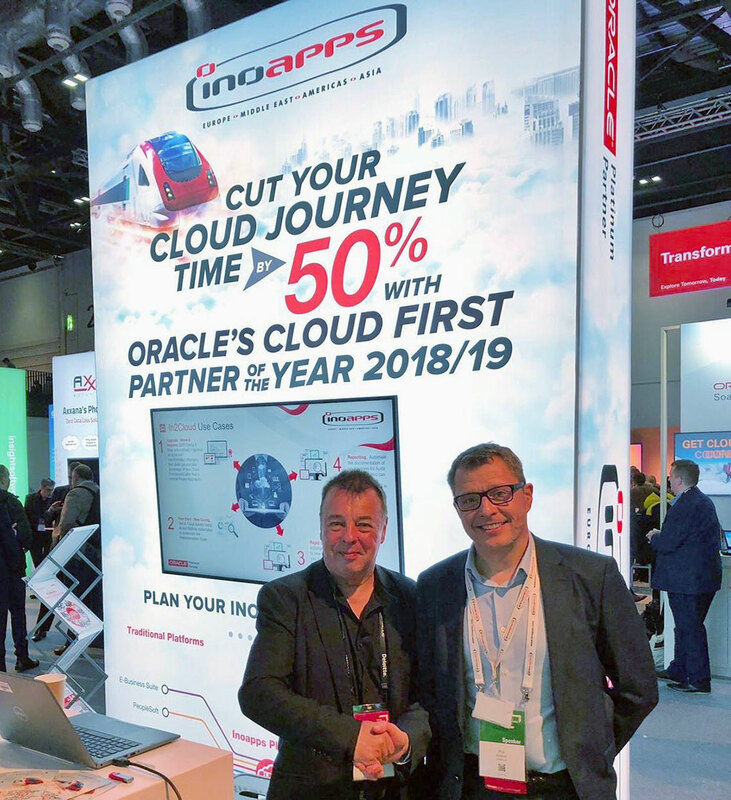 Oracle Open World Europe, LONDON – Rapid4Cloud (www.rapid4cloud.com) the leader in Robotic Process Automation for Oracle EBS and Oracle ERP Cloud is pleased to announce a strategic partnership with Inoapps (www.inoapps.com), a leading Oracle Platinum Partner. Thru the inclusion of Rapid4Cloud’s state-of-the-art AI and RPA powered tools in Inoapps’ widely known In2Cloud methodology, clients will experience a rapid and more reliable Oracle Cloud implementation. Rapid4Cloud’s tools include an automated readiness assessment of moving from Oracle e-Business Suite to Oracle Cloud with the power to Extract – Transform – Load, clients’ configurations, Master and Transactional Data to Oracles’ ERP Cloud. The assessment performs an actual upgrade for a selected business and loads the customers’ data into the cloud system where it will work Out-of-the-Box. A complete upgrade of the entire business can be undertaken with confidence after a full understanding of the assessment has been completed. In addition to the automated upgrade to Cloud, Rapid4Cloud’s tools revolutionary approach to implementations through extensive use of automated intelligence and RPA technology that provide an extremely simple set of screens that completely eliminates the keying mistakes and produces a high-quality Out-of-the-Box solution in hours. This allows people to focus on the interfaces, customizations, reporting, test cases and testing while the mundane work is all done at electronic speed and available in a few hours. Inoapps has a well-deserved reputation for customer excellence. We are delighted that they have chosen to include Rapid4Cloud in their In2Cloud implementation methodology. We are also impressed by their global standing and believe they have a great deal to offer us. We are looking forward to working extremely closely across a global audience. Having successfully used the toolset at several projects, it was clear we needed to embed this into our delivery. We have customers presenting the benefits at Oracle OpenWorld London and will also showcase this in Dubai and Singapore. We have already developed an excellent relationship with Rapid4Cloud and are highly impressed by the ability of their rapid implementation toolsets. By combining this revolutionary automation technology suite with our proven methodologies, we can offer our customers unrivaled implementation speeds and flexibility. This means they can now begin reaping the benefits of their investment far more rapidly than they could before. We can now truly deliver on the promise of the Cloud. We will be working extremely closely together, with Rapid4Cloud, identifying areas where our feedback can help establish them as the global leader in automating the implementation, management and maintenance of Oracle Cloud applications. As such, this global Strategic Alliance supports our aim to invest in innovative technologies that transform the customer experience. It also reinforces our reputation as the partner of choice for multinational companies seeking to move to the Cloud. Participants of the Oracle Open World in Singapore and Dubai should expect the inclusion of Rapid4Cloud tools in Inoapp’s In2cloud methodology showcase. We bring a high level of expertise and rich experience of having used the software with Oracle applications at over 2,000 Companies around the world, covering a variety of industries including, but not limited to, Manufacturing, Distribution, Insurance, Oil & Gas, Trading, Hi-Tech & Utilities. The company’s product is built upon two key principles: Automation and Simplicity. We facilitate the setup, maintenance, and transition of ERP, CRM, SCM, CX and HCM systems with creativeness, divergent thinking, and Automated Intelligence.